Colin Smith and Neil MacRae in rare Aberdeen Sun! The last two years has seen us expand our range markedly with our own unique products and designs. Our mission to provide a one-stop shop for the needs of Cricket Coaches is not at an end and we hope to be announcing further additions in 2019. We pride ourselves in being , in some ways, trailblazers, taking new ideas and running with them and we aim to keep doing this. The headline grabber for 2019 so far is the re-launch of the Skyer range. Revamped, re-branded, expanded and improved we are hugely excited to be bringing this iconic product back to the market. We went back to the drawing board to the extent that the Skyer was no more and it has become Skyer 2.0 incorporating our very own HyperFace. The pad is the secret of the Skyers success so don’t be fooled by its appearance. The difference between the HyperFace and all those copies you can purchase on the cheap is like comparing night and day, hot and cold, good and S**t.
We have not skimped, with the HyperFace you get a highly technical material costing around 40 times that of the foam used by the copycats. We trust you won’t be disappointed. We have teamed up with Rawlings for the first time to bring a tailor made range of gloves for the cricket coach and player. We hope to have further announcements in 2019 and look forward to helping all Coaches and players achieve their goals. Ledgends Ltd (Katchet) was formed in 2004 by two Scotsmen, Colin Smith and Neil MacRae. Sportsmen, school friends and eventually International team mates, they have both had experience in all manner of sports, from Swimming to Rugby, Football to Tennis and Hockey to Cricket. It's fair to say that Sport was the main ingredient during a youth that was rudely interrupted by class rooms, lecture theatres and at the time a seemingly unimportant requirement to earn a living. But as long as they could play sport then they were happy. They traveled across the world to play cricket - Neil to South Africa and Colin to Australia - but always returned every summer to play for their club side in Aberdeen and the national team. Huge believers in the saying ‘You only get out what you put in’ they were mostly on the training ground long after the others had gone home. Both now retired from playing International Cricket, Neil with 31 caps and Colin with 181 they stay involved in the game they love with Neil an ECB Level 4 coach while Colin languishes at level 2, but can be occasionally seen on Sky Sports spouting his opinion as a pundit! ​They are committed to providing quality, innovative cricket coaching products to enhance everyone’s enjoyment and performance. 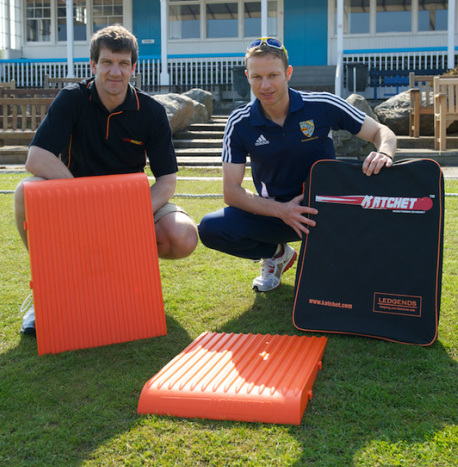 Now In partnership with Fusion Sports, Katchet are responsible for distributing the Skyer and Multi-Stump worldwide. Neil is now an International coach with Jersey having had successful stints with Scotland and Austria. Both Colin and Neil hope that their products can add to your performance and enjoyment - while training and playing. Please feel free to get in touch if you have any comments or ideas.